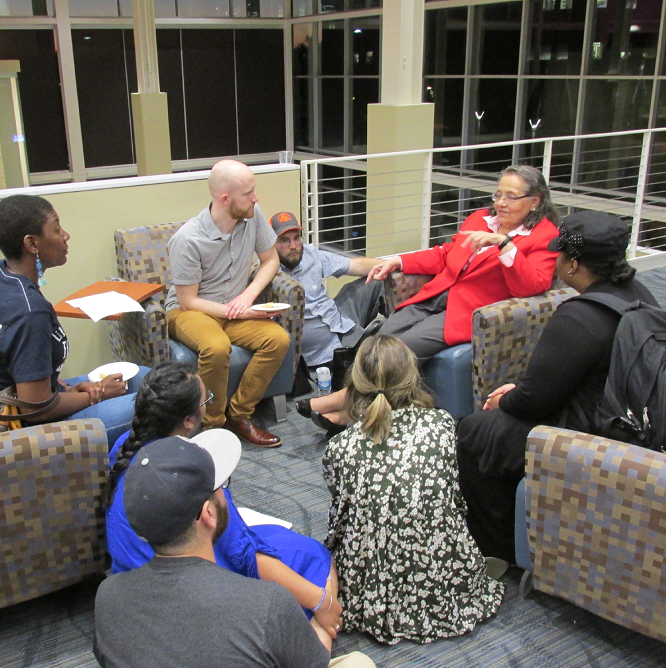 Earlier this month, Diane Nash told a full auditorium of University of Illinois Springfield students that she and fellow civil rights activists, “Loved you before we met you.” She said efforts to make the U.S. a more equitable place had been done, and are still being done, “For generations yet unborn.” And she urged others to join the cause, or risk sliding into what she sees as an increasingly authoritarian state. Nash, a native of Southside Chicago, was a key strategist and leader of the student faction of civil rights efforts during the sixties and beyond. She co-founded the Student Nonviolent Coordinating Committee (SNCC), which aimed to create a participatory democracy and helped initiate efforts that led to the march from Selma to Montgomery, and ultimately the Voting Rights Act, signed into law in 1965. Nash is a lesser-known civil rights leader in comparison with her male peers, though as time marches on, her contributions are becoming more widely heralded. In the 2014 film Selma, she is portrayed by actress Tessa Thompson. In the above video, Diane Nash speaks with Bree Newsome, an activist known for removing the Confederate flag from the South Carolina capitol grounds in 2015. Nash is one to cut right to the heart of the matter. “No one can give you what you want unless you know what it is,” she told students. As a young person, she asked Nashville’s mayor, on the steps of City Hall, if he believed it was wrong to discriminate against people based on the color of their skin. He said he did believe it was wrong, and Nash said that led to a positive shift that ultimately helped lead to the desegregation she and others fought for. Nash favors a term she coined in place of “nonviolence.” She calls “agapic energy” a force based on the love of all humankind. It’s a force that can be used to “wage war without weapons of violence,” with energy produced from love versus hate, she said. According to her philosophy, individuals are never the enemy. Unjust political and economic systems are the enemy, racism is the enemy – but you can love an individual regardless of their beliefs and actions while confronting the systems they represent. The issue of economic inequality is one she said needs to be prioritized by activists today. Nash told the audience she has often been told to wait, to allow governments and officials to come to desired resolutions on their own. However, she said if she and others had waited for the government to implement desegregation in the south without putting their lives on the line, “We’d probably still be waiting.” Nash talked about the importance of “people-led” movements, and said while they can be powerful, as they were in the sixties, they are often downplayed in comparison to warfare. Deja Washington is a junior studying political science at UIS. Like Nash, she’s a native of Chicago. 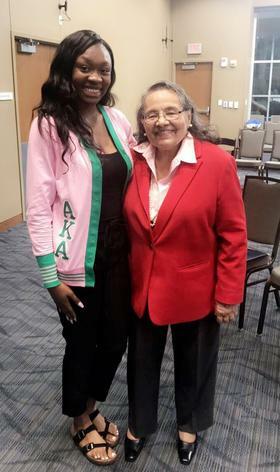 She’s the intern for the Chicago Southside chapter of the NAACP and Secretary of the Black Student Union at UIS. She asked Nash at the end of her lecture how one can refrain from resenting a racist individual for their beliefs. Nash told Washington one must consider the underlying elements that cause racism and systemic oppression in the first place, such as the lack of education and employment opportunities. Nash granted Illinois Newsroom a sit-down interview before her remarks at UIS. The following recording and transcript are from that exchange. She begins by telling us what sparked her original activism. Diane Nash: I was in Nashville, Tennessee and it was the first time that I had experienced overt segregation, and by that I mean segregation where there were signs that said “colored,” “white” and “white only.” It was possible for blacks to purchase food at downtown restaurants in Nashville, but you could not sit down and eat. You had to get it on a take-out basis. So if you went downtown during the lunch hour, blacks who worked downtown in Nashville would be sitting on the curbs near the alley, eating lunch that they had either brought from home or purchased on a take-out basis from a local restaurant. And I found that demeaning and humiliating. It made me angry. Blacks could not use the public library, public parks, hotels and so forth. It was like that in order to make you feel inferior. And when I obeyed segregation’s rules, I felt like I was agreeing that I was too inferior to go through front doors or use facilities that the general public could use. And so I started looking for an organization that was trying to confront segregation. Illinois Newsroom: We hear a lot about civility these days. US Rep. Maxine Waters suggested the public confront those who work for President Trump if they see them in public. Fox News panelists had a field day with this. On at least one segment some called her a “domestic terrorist.” And then we’ve all heard the debate about athletes protesting. What do you see as appropriate protests? I am so proud of Colin Kaepernick and all the athletes who have protested police murders with no accountability and I think it’s perfectly fine for people to verbally voice how they feel. If people are mistreating government, if business goes on as usual, there’s less incentive for people to change. So I agree with Rep. Waters and I think that’s very civil. When the United States has a difference with foreign countries, we bomb them and send in the military. And I think compared to the way we act as a country, when we have differences with people, taking a knee, that doesn’t hurt anyone. And verbally telling people what you think is so very mild and so very civil. You began organizing as a young person, as a student. You organized other students. If at the time you could have looked into some sort of time machine during the sixties and seen the state of race relations in the United States today, do you think you would’ve been happy about it? Sad? Surprised? I’m surprised. We had a slogan in the sixties: “Freedom now.” We did not realize that there are elements in the country that want to roll back progress. There are elements in our country that want to see segments of the population, not just racial but low-income segments of the population, wretched. There are people who want to destroy Medicare and social security and public schools and food stamps, etc. I think many of the people who I’ve worked with during the sixties who were also students did not understand that that element was present. And we thought that if we made progress, it would be progress. What’s the main reason you do continue this work? Specifically with young adults and students? Students and young adults have their whole lives ahead of them. They’re going to bring children into this world. They are going to live in this society themselves. Not to mention that I have reached a ripe old age, but I still live here. And it makes sense to me to make my country the best that it can be. Next post: Medical foods are vital for a rare disease. Why doesn’t insurance cover them? Previous post: Who Benefits From Video Court?